Youssoufou Bamba flew to New York from his previous posting in Vienna and took questions from the Press on December 29. Video here. On December 30, sources told Inner City Press that Bamba was not able to get into the Ivorian Mission, that “someone inside kept changing the security code” to bar him access. Why rush to New York on December 29 for a photo op presenting credential to Ban Ki-moon and then not enter the Ivorian Mission nearby? Inner City Press has asked for the identify of the “US senior diplomat” and to attend the January 3 entering of the Mission. Watch this site. Footnote: A senior UN official to whom Inner City Press directed a question about Bamba's banning from the Ivorian Mission expressed surprise, saying "that's the opposite of what happened in Brussels." UNITED NATIONS, December 29 -- In New York on Wednesday, Laurent Gbagbo's former Ambassador to Austria Yousoufou Bamba became the Ouattara-nominated Permanent Representative of Cote d'Ivoire to the UN. After a ceremony with Secretary General Ban Ki-moon, Bamba sat to take questions. Inner City Press asked Bamba if the Ouattara government can confirm Gbagbo's use of mercenaries, and if it would support an investigation by the International Criminal Court of Gbagbo and his supporters. Inner City Press is putting exclusive video of the full Q&A online, here. Bamba said first the killings must be stopped, before there is any discussion of the ICC. He referred, as the UN has, to markings on doors based on tribal affiliation, and said things are close to a “genocide.” He said there are Liberian mercenaries embedded in Gbagbo's Republican guard. With state broadcasters whom the UN has likened to those in Rwanda in 1994 now off the air outside of Abidjan, Inner City Press asked if Ouattara's forces had been involved in taking the stations off the air. Bamba refused to comment, just as the UN has. In light of Soro statements seeming to call for military action by ECOWAS, Inner City Press asked Bamba if Ouattara too supports outside intervention. Bamba said that there is a negotiation taking place that is sensitive, and that he would not discussion intervention, nor safe passage for Gbagbo. Inner City Press asked Bamba about his previous service to Gbagbo. Bamba responded that he is a civil servant of 25 years, who served under pre-Gbagbo Ivorian leaders. Later, Inner City Press asked Bamba how he is being paid, he called it “too personal” and said only that in his years as a civil servant he had developed savings. Since Bamba insisted repeatedly on his years as a diplomat, Inner City Press asked what he made of Russia's opposition in the Security Council to the press statement noting ECOWAS' recognition of Ouattara as the election's winner, and Russia's opposition to the change in credential from Djedje to himself. I was not here in those meetings, Bamba said, refusing to comment further. The presentation of credential ceremony included the same Ivorian Mission Deputy who served under Djedje, and has held the seat since. US Ambassador Susan Rice told Inner City Press he had not gone over to "the dark side," and he will apparently continue. How big a change Bamba will be remains to be seen. Watch the video -- click here -- and watch this site. 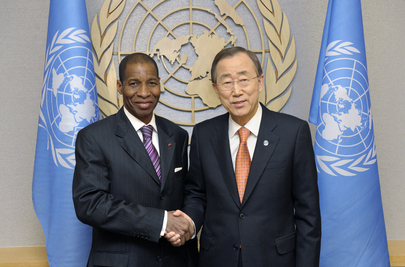 Footnote: present at Bamba's handshake with Ban Ki-moon was Ban's spokesperson Martin Nesirky. Throughout this week, Inner City Press has directed to Nesirky questions about Cote d'Ivoire, Sudan and other UN topics, without any answers. On Wednesday morning, Nesirky indicated there would be answers later in the day. As of this publication at 2:30 in the afternoon, no answers have been received. We'll have more on this.